(1) Intent. Complete five rounds of the exercises as quickly as possible in a safe manner. This is a three-person, team, "task-specific" workout. The team's time ends when the last member of the team completes the workout. The purpose of this workout is to develop cohesion and combat fitness under fatigue conditions through shared hardship, challenges, and competition. (2)Scheme of Maneuver. The platoon will be divided into as many teams of three as possible. Each team will require a 50, 55, or 60-pound rock or sand bag. All the teams will start at the same time. Each team member has a specific exercise to perform. 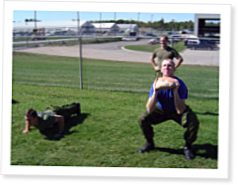 A soldier will be doing either squat cleans or pushups, or resting.